Are You Bitter or Better? One of my favorite people, and certainly one of America’s One finest communicators, is Neal Jeffrey. Neal, as quarterback, led the Baylor Bears football team to the Southwest Conference championship in 1974. Today, he addresses many youth groups as well as adult businesspeople. He is truly one of the most humorous, sincere, and capable speakers I’ve ever heard. The interesting thing is that Neal is a stutterer. However, he has chosen to make stuttering an asset, not a problem. Now think about what you just read. A very successful quarterback and public speaker who stutters doesn’t compute in the minds of most people. Neal Jeffrey has taken a negative and turned it into a positive. After speaking a few minutes, he tells audiences that in case they hadn’t noticed, he stutters. Then with a big smile, he says, “Sometimes I do get hung up a little bit. But don’t worry. I guarantee you something’s coming!” The audience invariably responds enthusiastically Neal is the classic example of an outstanding individual who chose to make an obstacle an asset. The obstacle has forced Neal to be more creative and to do more reading, research, and studying so he can most effectively turn that liability into an asset. Result: He got better, not bitter. He is better not in spite of his stutter, but because of his stutter. Neal has reached and is reaching goal after goal in all areas of his life. I believe that you can do the same thing. When (not if) troubles and problems come your way, remember that the only way to the mountaintop is through the valley. All of us have liabilities that can hold us back or propel us forward. In most cases, the choice is ours. So, take your obstacles or liabilities, recognize and evaluate them, and then find a way to turn them into assets. – Zig Ziglar. 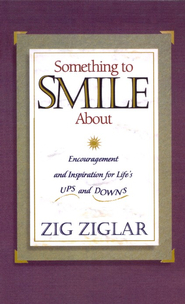 Something to Smile About: Encouragement and Inspiration for Life’s Ups and Downs (Kindle Locations 1215-1226). Kindle Edition.